The business “fictitious name” name was already taken, but FMG remains part of my weekly ritual. For those who might not have had me relate this story, FMG began in the early part of 1991. There were three officers, two Navy commanders and an Army major stationed at the Naval Amphibious School, Coronado for our twilight tours, who played golf together every weekend. 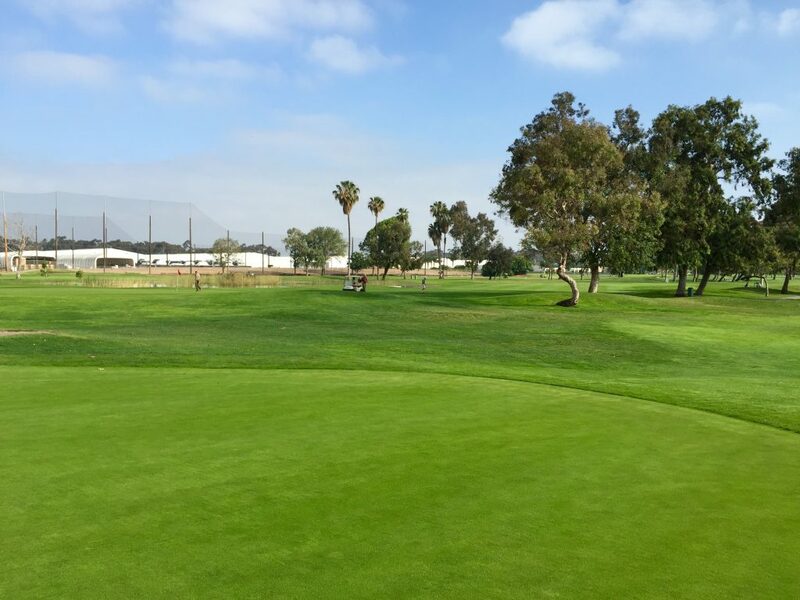 It was often difficult and frustrating to get tee times on the four Navy courses (at the time, Sea ‘n Air at Naval Air Station, North Island, Admiral Baker North and South, and the Navy, Marine Memorial course at Naval Air Station, Miramar. The reason was a large number of military retirees would play on the weekends, the only time the active duty could play. So the three of us, Rod Stark, Marty Linville, and i vowed, once retired to not play military courses on weekends except for tournaments so active duty personnel would have less competition for tee times on weekends. We have kept to that vow. 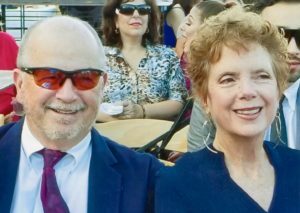 After retirement, Rod became the club pro at the North Course in Sun City, California; Marty went to work as an expert in human/weapons system interface for a military consulting business, and i, with our younger daughter Sarah being born on the day i retired, became mister mom. Marty and i would occasionally get a round in together, and during one of those in early 1991, we came to agreement on playing on Fridays. Marty was working a four-day, ten-hour schedule, and i, of course, as mister mom, could have Maureen take two-year old Sarah to a day-care, (the wonderful Karen Escobedo) for the morning. The two of us have been playing Friday morning golf at military courses, mostly North Island, since then for twenty-five years. Rod rejoined us in the mid-1990’s. 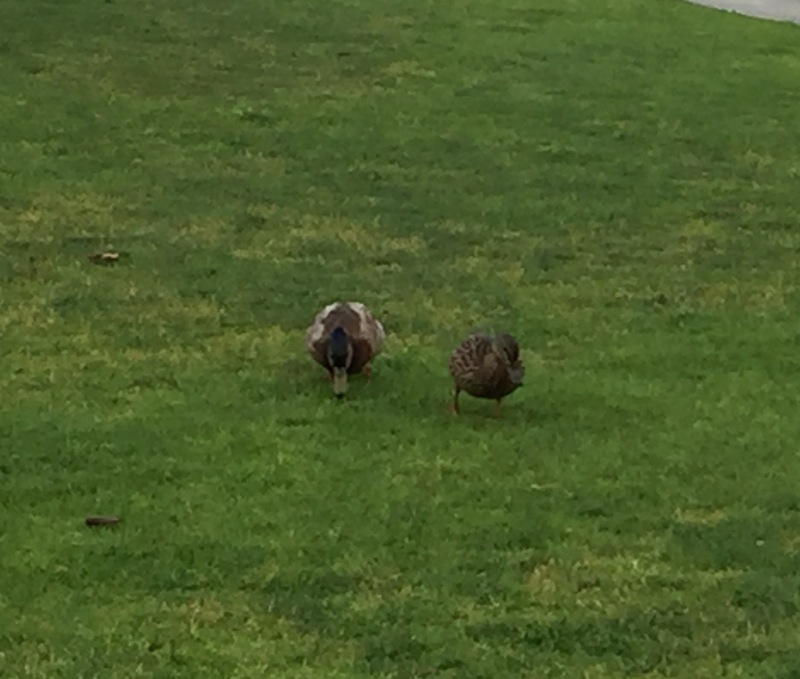 We’ve had others join us, as many as three foursomes a while ago. Now we have a base group of the three of us, Pete Toennies, Bob Shoultz, Mark Shults, Jeff Middlebrook, and Ed Hebert. When Al Pavich recovers from some medical issues, he will rejoin us. Jim Hileman is an occasional addition, and often we bring guests. We nearly always have two groups playing. Our rounds are most frequently at North Island, which i have described before. But today, it just seemed so perfect. Yes, i had a good round for me, but the joy of walking about five miles along the coast with friends validated my belief of my being a very lucky man. 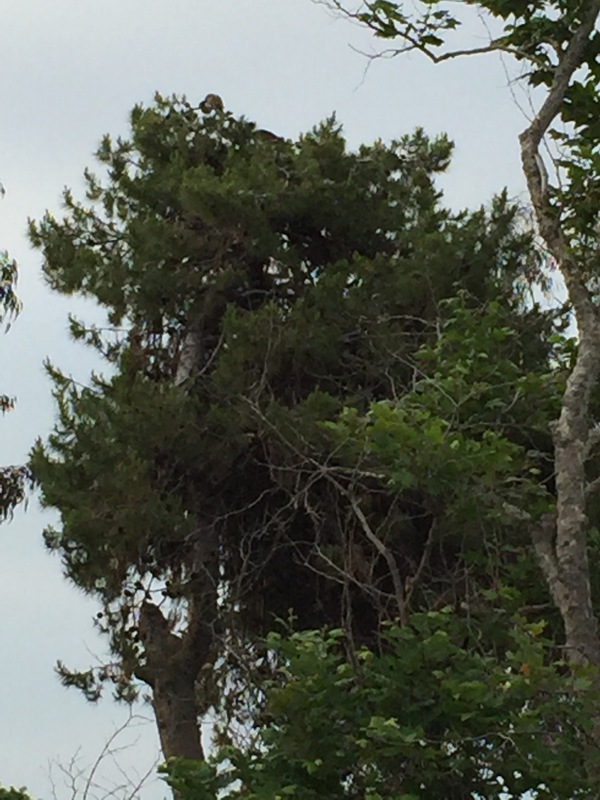 The gray shapes at the very top o f this pine are two young ospreys learning to fly. The mother, much larger was in a nearby tree. The trees are next the second tee. A male an female osprey used to nest at the top of a light standard behind the fourth tee, but it was torn down to make way for a new enlisted quarters complex. We think (hope) this is the same family repeating the spring ritual again of having two new additions each year. The pond guarding the second green is a favorite for ducks and the pretty much worthless coots (who destroy the grass around the ponds and litter the greens with coot poop). 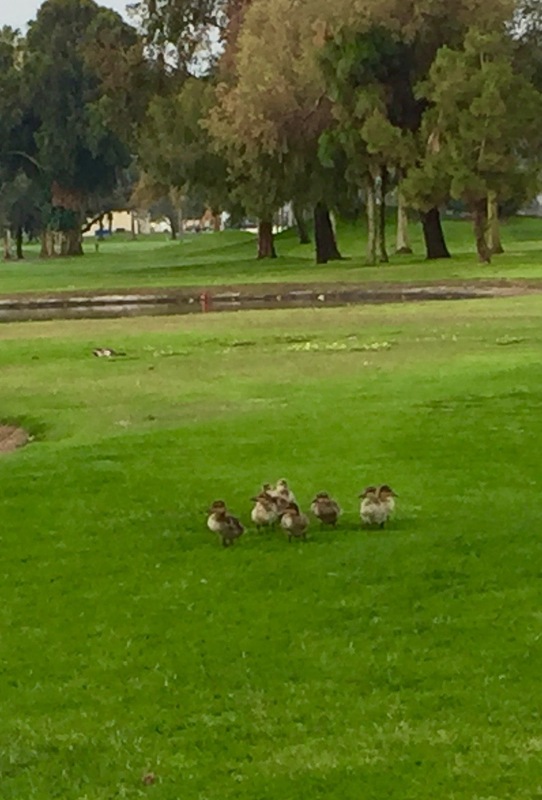 This family of eight ducklings were unafraid as we walked to the third tee box. Perhaps that was because mom and dad were about five feet away. A view from the fifth green. The original nine, now the front nine, but greatly altered, was created in 1975, mostly constructed by Seabees. The view is looking at the driving range on the left, an aircraft parts supply complex in the background, and golfers on the first fairway. 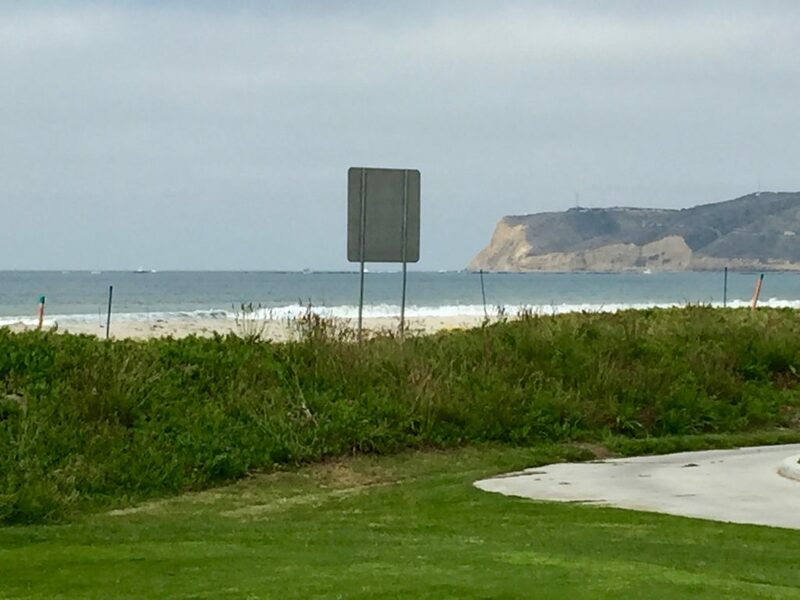 And finally from the fifteenth tee, a sight i always enjoy which sometimes makes me nostalgic is the magnificent Point Loma and the channel entrance into San Diego Bay. Not visible here, but on the horizon, is a flat top (aka aircraft carrier) steaming south to reach buoy #1 and begin its transit down the channel to its pier. i cannot play here without thinking of how many men and women are away from home port on seas far away and foreign lands in harms way. It makes me feel good to remember i was once one of those who defended our freedom.